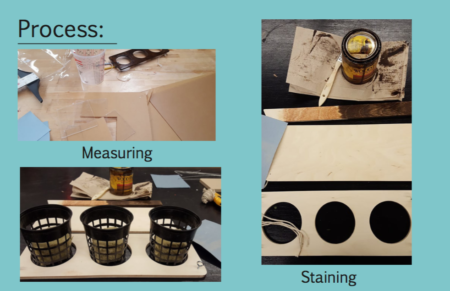 As the semester comes to an end, I’ve learn a lot about myself as a maker and a creator. 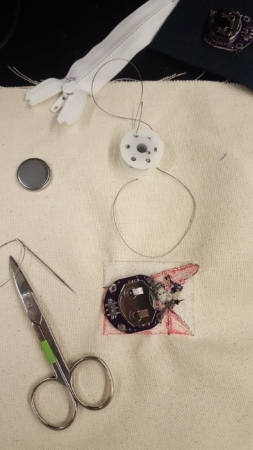 Makerspace has allowed me to explore my comfortability with creating things such as soft goods through sewing and even coding. Before entering this course, I was relatively uncomfortable with coding and never worked with an Arduino, but I am intrigued to learn more and possible even buy my own kit in the future. Many of the skills that were taught in Makerspace were relatively new to me, which got me out of my comfort zone. 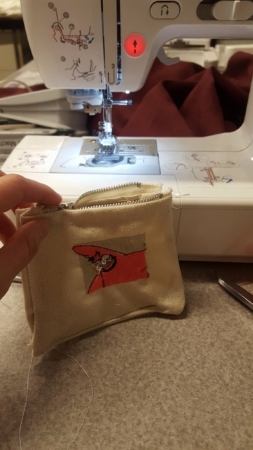 I would’ve never learned how to sew or laser cut if I wasn’t forced to do it for an assignment. I think that makerspace has allowed me to explore new areas of creating and encouraged me to keep teaching myself new making techniques. Through my studio write-ups, I learned that I used to spend too much time brainstorming, rather than making the product. As an industrial design major, I focused a lot of form over function. In a sense, Makerspace was an even ground between function and form where I learned how to make things work, but also tried to make the product look nice. 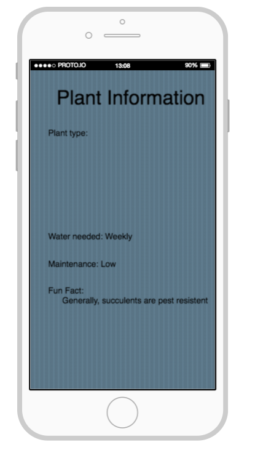 For my final project, I decided to create a hydroponic system where users can water their plants through a phone app. The goal was to combine something I was uncomfortable with (coding) and something I’m comfortable with (craft fabrication) and design a product. I wanted to spend less time brainstorming and more time figuring out the mechanics of the system so that it can actually function. I decided to go to the fab lab to meet with Andrew and discuss the mechanics and functionality of the system. 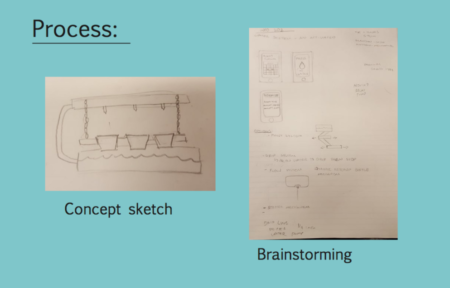 We wrote down the list of supplies that we would need to create the system and I started to sketch and brainstorm some ideas. I ended up with the idea of creating a plant system that can be hung from a computer desktop so that the user can have something else to look at the reduce eye strain. 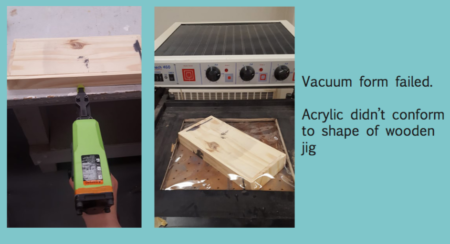 After brainstorming and sketching the idea, I headed to the art and design building woodshop to cut the wood using the bandsaw. After cutting the general shape, I sanded the edges and measured the size of the plant pots. I used the drill press to drill holes into the piece so that the plants can fit into the holes. I then used a wood stain on the wood to create a rustic look, then use polyurethane to make it waterproof. I also drilled four small holes on each corner of the wood pieces to screw the i-hooks into each piece to hang the strings from the hooks. Eventually, I got my drippers, tubes, and water motor from Amazon. 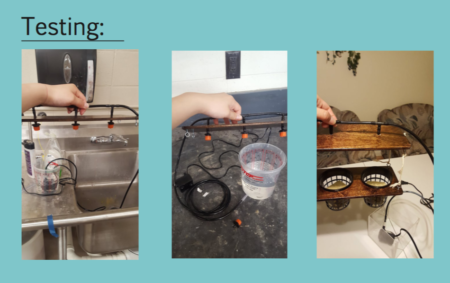 I connected everything together to test the water flow. One slight problem that I ran into was that the tubes needed a connector to connect the tube to the motor. I ended up using a heat gun to melt a larger tube and use it as a connector to connect the motor and the other tubes. The drip system worked perfectly after that. I also wanted to create a water reservoir out of acrylic, but the vacuum form didn’t end up working so I used the bandsaw to cut acrylic sheets and hot glued them together. The hot glue mostly worked, but it wasn’t fully leak proof. I improvised and ended up using a small bucket instead. In terms of the app, I realized I didn’t have enough time nor coding experience to create it. I ended up creating a mock app that would mimic the functionality of the real app. 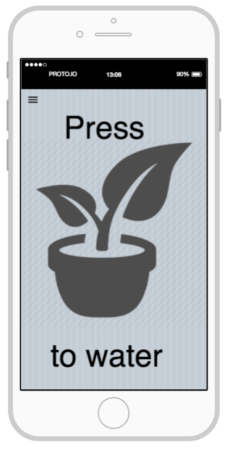 The app would have a “press to water” button so that the user can water their plant when they’re away from home. 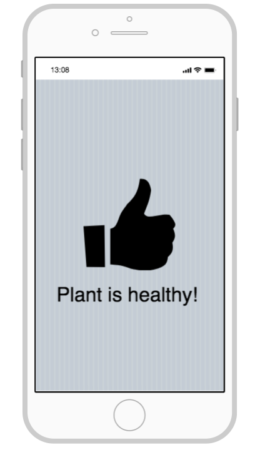 They can keep track of the amount of times a plant has been water through their plant tracking calendar and there’s a section for the user to search information regarding their plant’s health. My goal was to quickly iterate so that I can fail quickly and make a functioning model. I planned my project out very well so that the system would actually function. 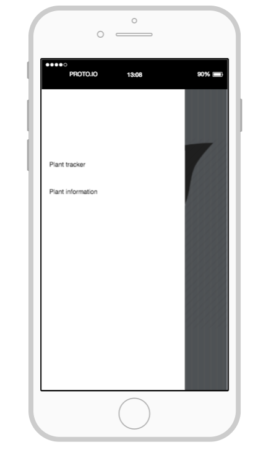 My model ended up functioning to a certain degree and the mock app was close enough to what I wanted to make for the real app. 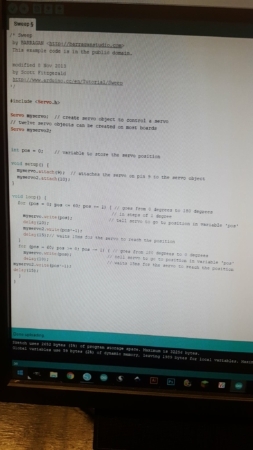 I also wanted to do some coding to create the app, but I realized I would need a lot more time and coding experience to make a functioning app. Overall, the project was a success even though I didn’t incorporate code. To counter this, I created a mock up app so that people could have a general sense of what it would look like and how it would function. 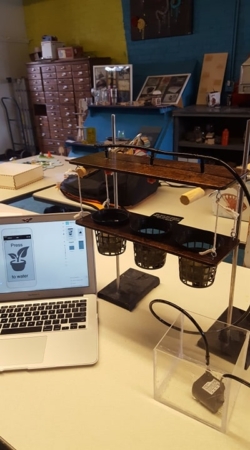 I was happy with the project because I created a self sustaining plant system project for industrial design last semester and wanted to use this final project as a way to iterate and create something slightly better. I would love to continue work on this project and possible develop a functioning app. I would call myself a maker because I often create objects and products for classes and for fun. I think anyone should be able to call themselves a maker as long as it shows craftsmanship and that they’re making something meaningful to them. 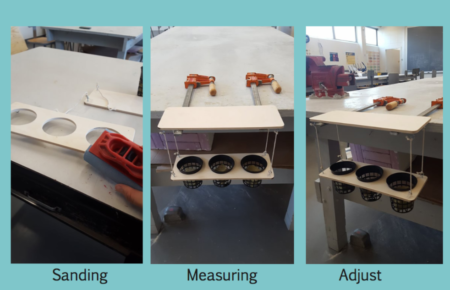 The quotation was meaningful to me before the class because I often made prototypes and models for class and they were hands on and the products I created were usually meaningful. I’ve always been a hands on person so I really enjoyed the class and learned a lot. Before starting the project, I knew I wanted to do another iteration of the 3D project. 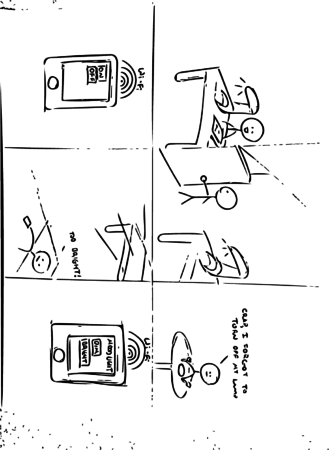 I knew that the phone I made in the beginning looked unproportional and that I wanted to make it slightly better. 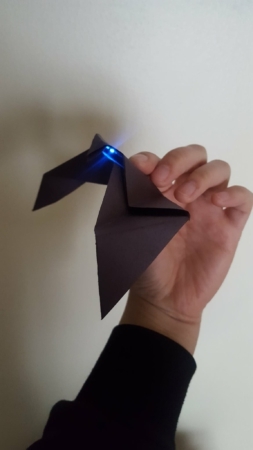 Initially, I wanted to create a 3D action figure that uses a LED light, but I did some more brainstorming and decided to design a phone case with a fidget component attachment on the back. I wanted to do this because I wanted to create a more proportional 3D print and give it a function. 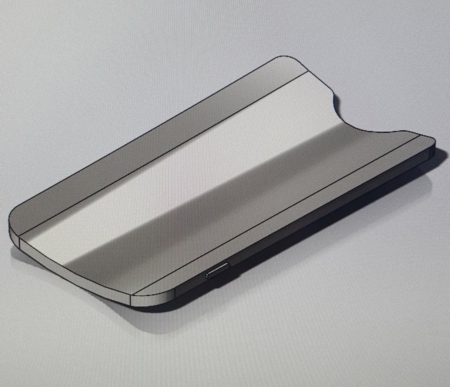 I figured that many people carry their phone on them at all times and when it comes to people fidgeting, it’ll be more convenient for people to have a fidget component attached to their phone so that they can use it without having to carry both their phone and fidget toy. 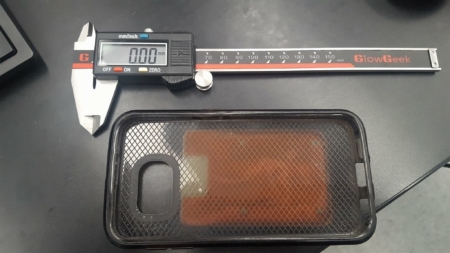 While working on my project, I took my current phone case and measured the dimensions so that the 3D print would be proportional. 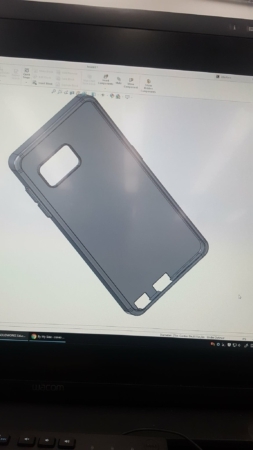 Additionally, I used autoCAD to create the phone case because it has more available features such as fillets, extrusions, and the ability to assemble multiple parts. 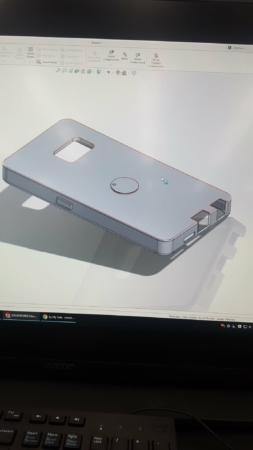 I decided to draft a phone case by combing a component of the fidget cube and placing it at the back of the phone case. I measured the approximate comfortable distance to place the fidget component on the case. 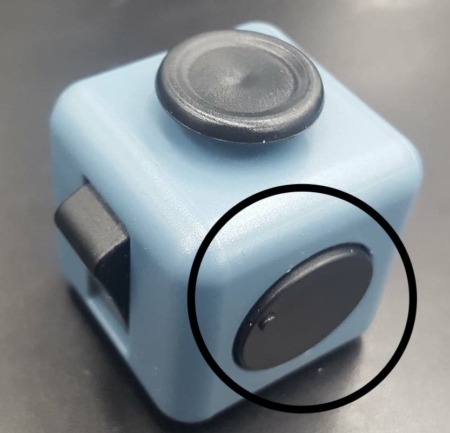 I ended up using the circular disc from the fidget cube because it produces no noise and it isn’t bulky, so it doesn’t interrupt the flat surface of the case. 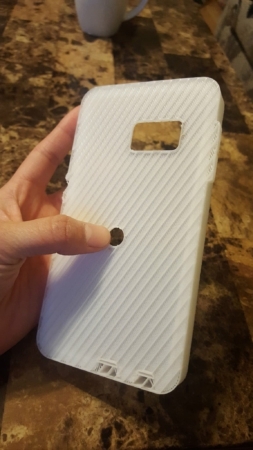 I sent the 3D print through multiple (4) times, but I received an error for printing the circular disc or the fidget component at the back of the phone case. The case came out to be the correct proportions, but I couldn’t figure out why the disc kept on failing. 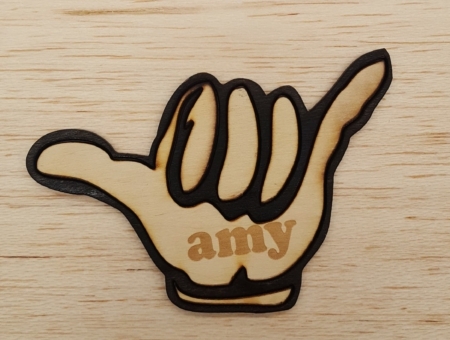 I think it was because its too small for it to print, so I might have to create a wooden disc through laser cut or hand make in the woodshop. 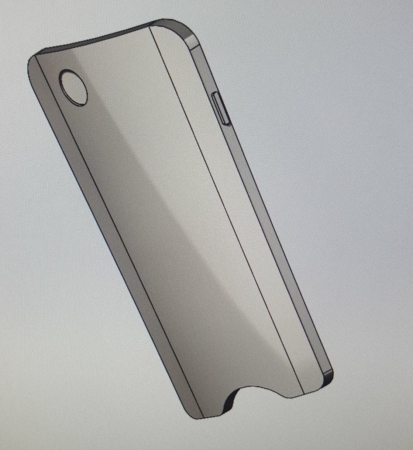 Other than that, the phone case come out with the correct proportions. Overall, it was nice to create another iteration of our old projects. 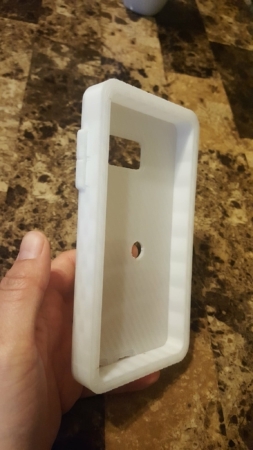 The case came out fine, but it was stressful trying to create multiple 3D parts. 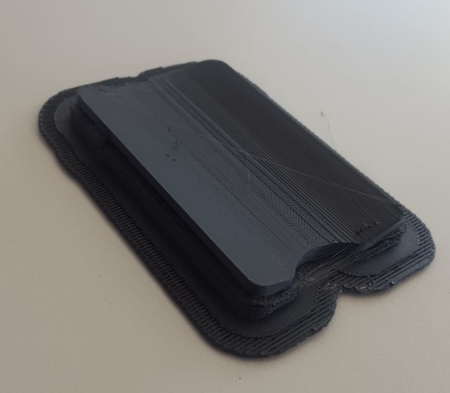 I tried to send the print through so many times that I ended up getting frustrated. 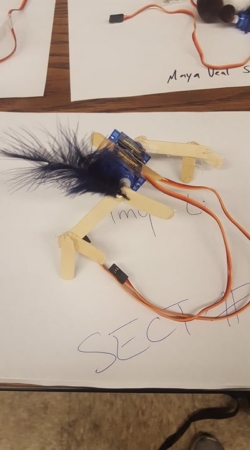 In my initial concept, I wanted the pom-pom bot to drag itself from point A to point B and I planned on giving it a set of legs to help move it forward. I only planned on using popsicle sticks because I never really considered it. To me, it seemed slightly unnecessary to decorate it, I wanted to focus more on the coding and the motion of the pom pom robot since I didn’t have prior coding experience. I forgot to take a picture of my initial model, however, it had two popsicle sticks taped on each motor. This didn’t work because the robot wasn’t able to balance on itself and it constantly fell over. I figured that I had to create better leg support for standing and probably a stronger grip so that it can pull itself and glide against the table. 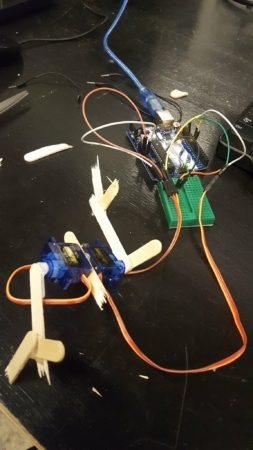 I also had to change the code so that the robot moves forward with one motor and the other motor goes the opposite way so that it works like legs in motion. My second and final prototype worked but not exactly the way I wanted it to. I changed the code so that each leg of the robot moves at different times. I also added a popsicle between the two motors so that they stick together and works a little bit of a balance. The final prototype moves forward but also jumps upward and forward, thus dragging and bouncing the robot forward. I added more popsicle sticks to the motors so that the robot balances and stands on its own. I also added hot glue to the bottom on the sticks so that there was more traction against the table. I also ended up putting a little feather on the robot for a little bit of bedazzle. Overall, it was a fun project, I would definitely spend more time coding it and making it move more smoothly and make the robot look more finished. 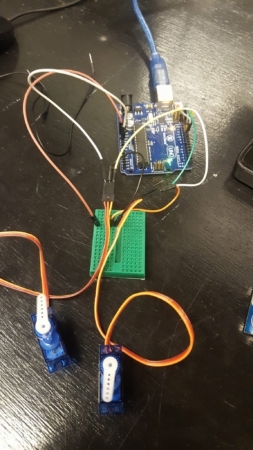 During class, I started tinkering with the ultrasonic sensor. 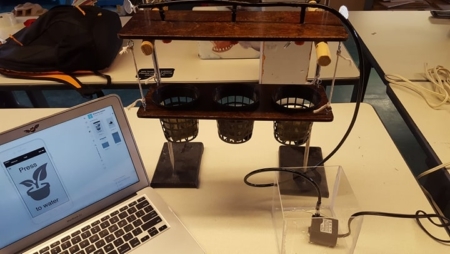 It was an interesting process because I never previously learned how to code using Arduino. 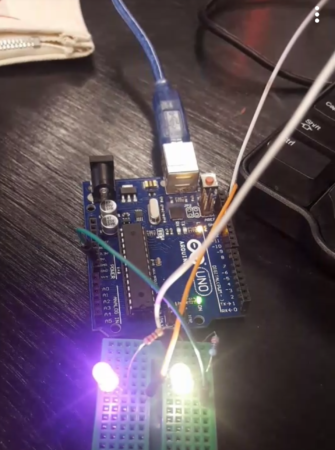 I entered a couple of codes and couldn’t get it right, but since Arduino is such a popular program, I was able to use Google to search up some existing codes which ended up working. 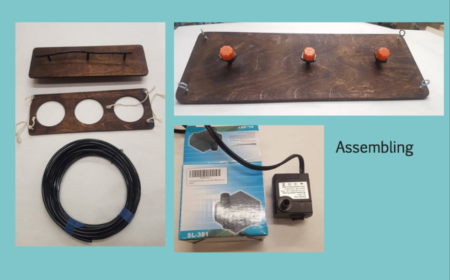 I thought that the Ultrasonic sensor was an interesting tool. I thought I could create a program for users to turn the t.v on and off or switch channels using voice command. I thought that it was an interesting concept until I realized that Alexa from Amazon was already capable of this function. 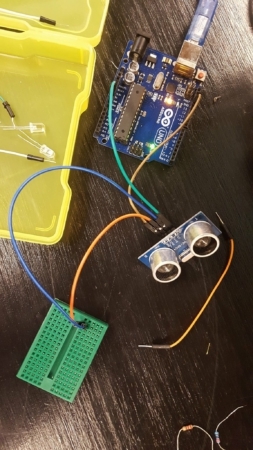 I ended up searching for other existing sensors and found the Arduino WiFi Shield. 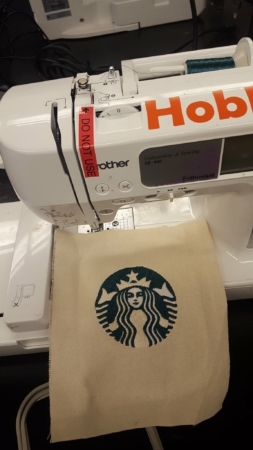 In our discussion section I created a embroidery of the starbucks logo. 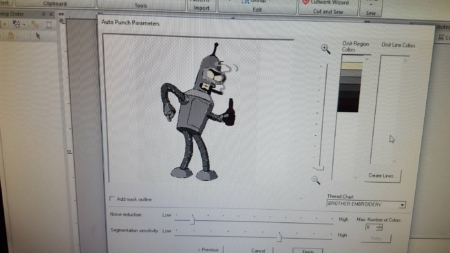 While trying to find what I wanted to embroider, I found a picture of Bender from Futurama and wanted to use that as my embroidery, but then realized it was a too complicated to do in the duration of class. 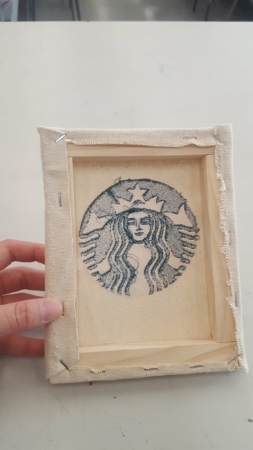 I settled with the Starbucks logo and it was a pretty interesting process. I liked it alot that I decided to make it into a canvas stretch in the woodshop. 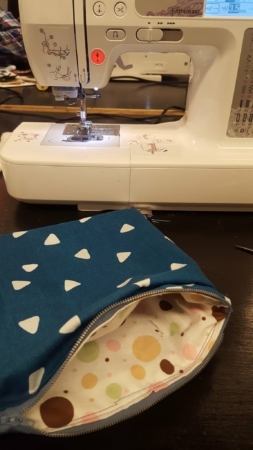 We also learned how to make small bags using the sewing machine. During the project, I decided to create an embroidery of Bender and make his metal bottom shine and cigar shine. 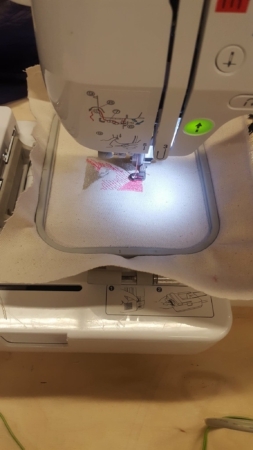 However, the images gathered of Bender are too complicated that the details wouldn’t come out when using an embroidery machine. I ended up choosing to do a spongebob meme of evil Patrick. 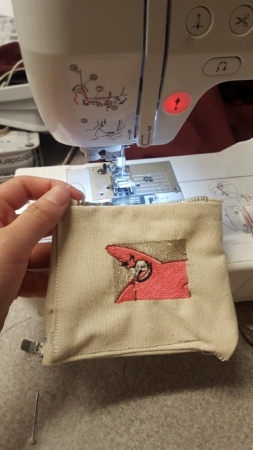 I wanted to create a sort of fun project related to pop culture so I ended up making a coin purse/bag with Patrick from spongebob embroidered on the front. 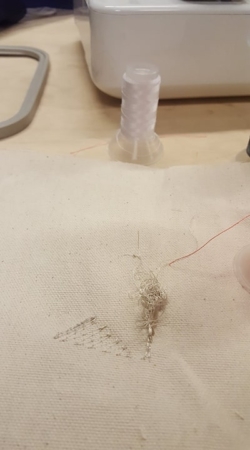 When I first started doing the embroidery, the machine gears weren’t tight enough so the back of the patch got a little bit fuss. I decided to restart the print and adjust the tightness a little more. The embroidery came out pretty well. 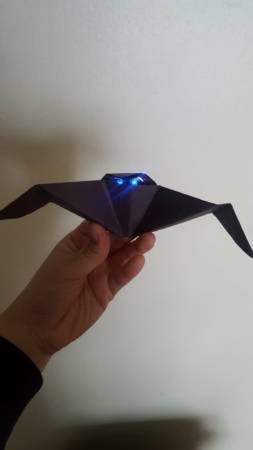 I created it in hopes that Patrick’s eyes would light up, but I later found out that the conductive strings were sewed too closely to the positive and negative that I short circuited the battery. If I were to do this again, I would definitely make sure the lights worked before sewing everything together because its difficult to fix the lighting problem after I sewed everything together. At the beginning of the project, I explored different design platforms such as tinkerCAD, Sculptris, and 3D scanning. 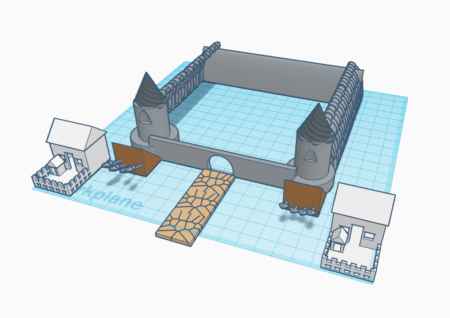 During class, I created a castle using tinkerCAD. 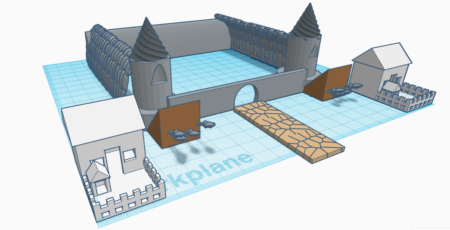 After having experience in SolidWorks, I strongly disliked tinkerCAD. I hate that I am limited to using shapes on a grid. It is very restricting and difficult to create organic forms and curves. 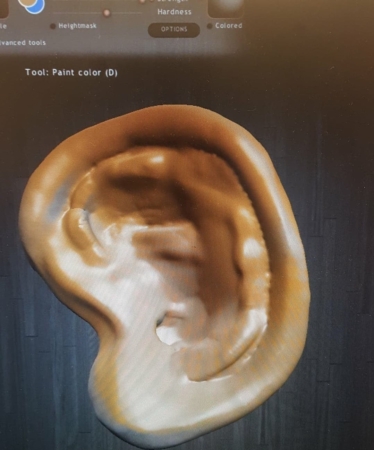 Then I switched over to using Sculptris and experimented with the software and created an ear and colored it. I liked how I was able to create outrageous organic forms, but it was difficult getting geometric shapes and dimensions into the structure. 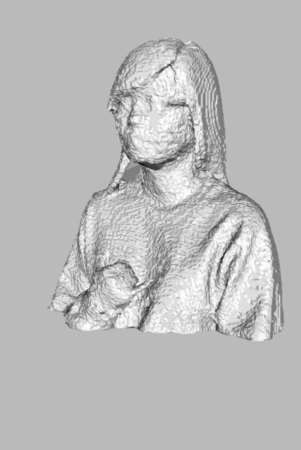 I was also able to use the 3D scan and scanned myself. I thought that it was an interesting tool, but I didn’t want to scan an existing object and make something out of it. I wanted to make an original design. 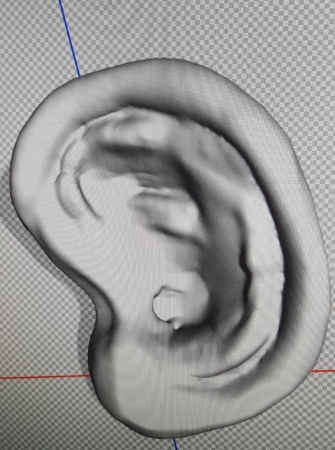 When I first started the project, I knew I didn’t want to use tinkerCAD because it was too restricting and Sculptris didn’t allow me to dimension my forms. I decided to use SolidWorks because I was able to fillet my object, create extruded cuts, and haves specific curves and dimensions. I started off by doing some research on cell phones because I noticed that phones have the same rectangular structure for many years. A couple of problems I identified was that phones are flat and that it doesn’t fit into the pockets or conform to the thighs. I ended settling on a curved phone structure that conforms to the thighs with an interchangeable camera lense. 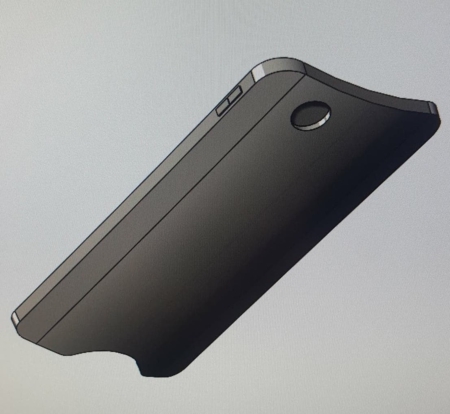 While working on the project I actually started off with using tinkerCAD to create the curved phone structure, but it was too restricting. 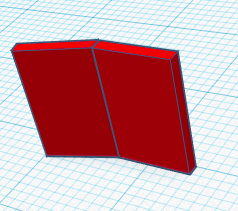 I couldn’t join two rectangles and have the form merge and create a curve so I switched over to SolidWorks. 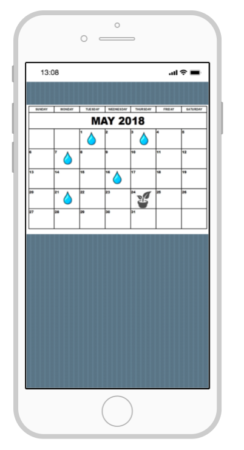 Overall, the project was slightly more challenging because I had to find a product that I wanted to change and conduct some user research to figure out what needed to be changed in terms of cell phones. 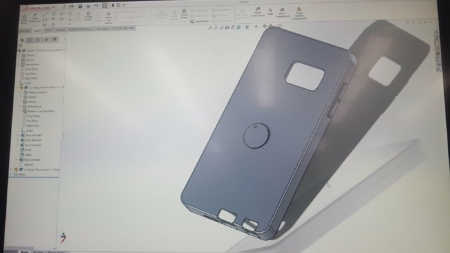 I chose to change the overall structure of a phone because I’ve noticed that flat rectangular phones are somewhat bulky and don’t conform to the thighs. 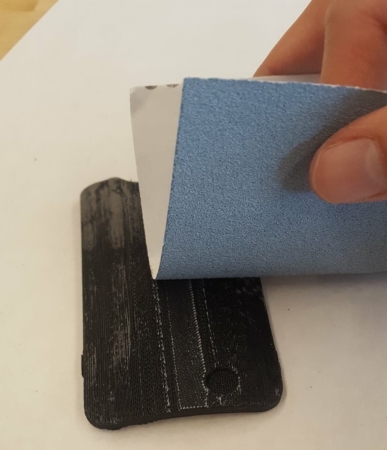 I also created a curve on the bottom of the phone so that people can use it as a supporting grips since most people use their pinky to prevent their phones from slipping. I also wanted the phone to have an interchangeable camera lense so that the user can take better quality photos rather than settling for a phone camera with one picture quality option. I think this project really makes us think about the user of the product and figure out what changes we can make to a product that’ll make the product more user friendly. I was able to learn a lot more about user preference. I also learned that 3D print sometimes fail, but mine didn’t necessarily fail. 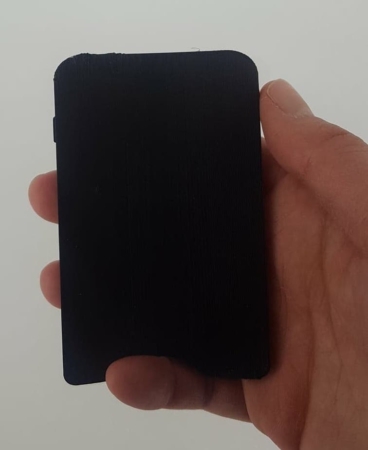 The back of the phone frame was slightly more rough than I wanted it to be. Additionally, the portion and size of the print wasn’t as I expected and it was a bit smaller than I wanted the actual product. 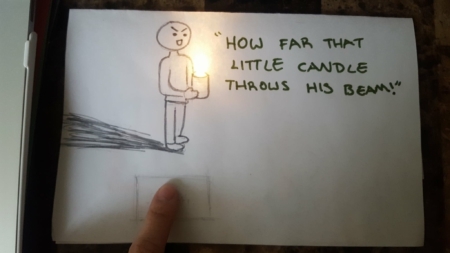 So if I were to redo this, I would adjust the size of the product and make it more proportional. Before beginning my project, I started off by looking at the copper tape structure I made during class. 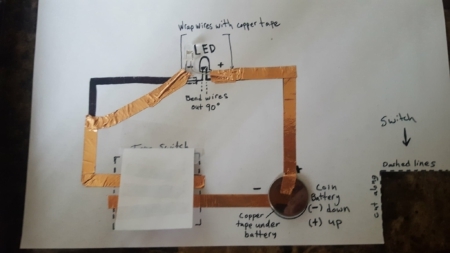 I kept in mind that I needed to have the positive lights attached to the positive battery and the negative attached to the negative side of the battery. I was pretty excited to start this project, but I wasn’t sure my lights would actually light up. While working on my project, I started off by looking for inspiration online. I thought about doing a pop up story that incorporates the LED lighting element, but it got too complicated so I scraped that idea. 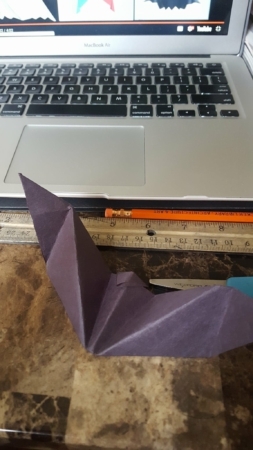 Then I started looking into origami and decided to create a bat. I thought it would be interesting to have the bat’s eyes glow. 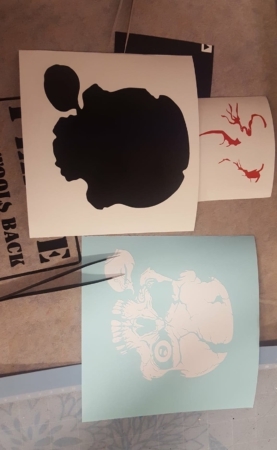 It was difficult getting the LED lights to work and show though the construction paper, but I fixed that by moving the lights further up so that it shines through a crack. Overall, it was a fun project, but I think I could’ve done something more grand and interesting. 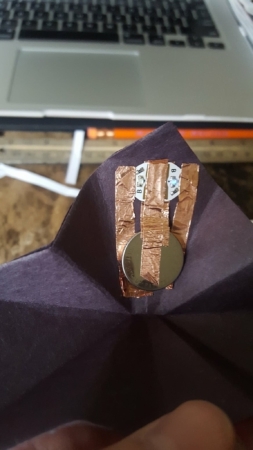 An origami bat is cool, but I also wanted to make a pop up book with moving characters. Thus, if I was given more time, I’d definitely do something more unique and interesting. 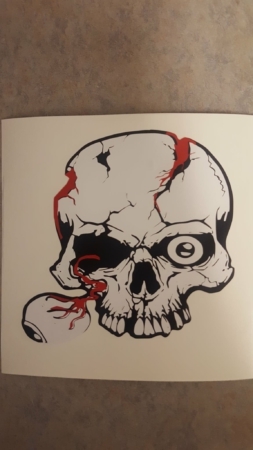 I made a sticker of a cracked skull with blood spilling through the cracks and an eyeball protruding from the socket. 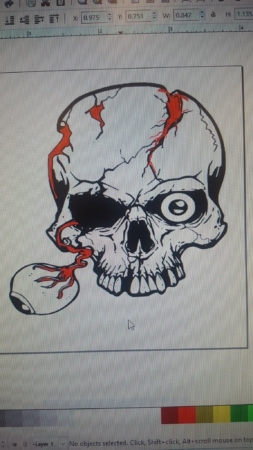 I created this because I liked skulls and thought that it was an interesting visual to recreate. 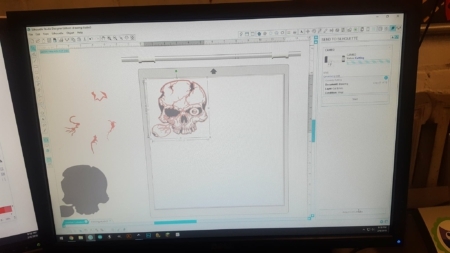 While working on this project, I enjoyed the process of finding photos that would match one another, such as the socket and the style of the skull. Eventually, after I put the entire piece together, I was told that the skull had too many lines and it would be difficult to print. I later got help from Duncan and worked around the problem, by printing the skull as a slightly larger sticker and having it as multilayer. It was slightly difficult removing the excess white parts of the skull and then transferring it over to the black background, but it worked out perfectly once I got the hang of it. Overall, I loved how the skull sticker came out. Duncan helped a tremendous amount in helping me troubleshoot any problems with printing the layers. Sticking each layer on top of each other was the most fun. It was especially rewarding to see that the sticker came out exactly how I wanted it to. I wanted to make my name tag look like a t-square because it’s an important tool used for drafting. However, the proportions of the t-square on the screen was proportionally off and I figured that the print my name would be too small, so I decided on a new design. I noticed that I’ve been using the Shaka, or the ‘hang loose’, hand gesture quite often. It’s a friendly gesture often used to say hello or goodbye. 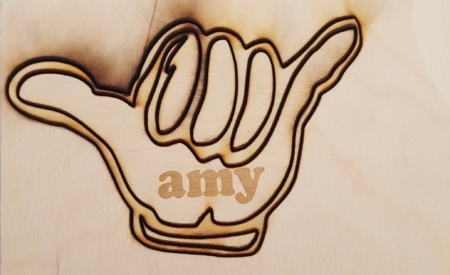 Thus, I decided to re-create the Shaka hand gesture and use it as a symbol for my name tag. 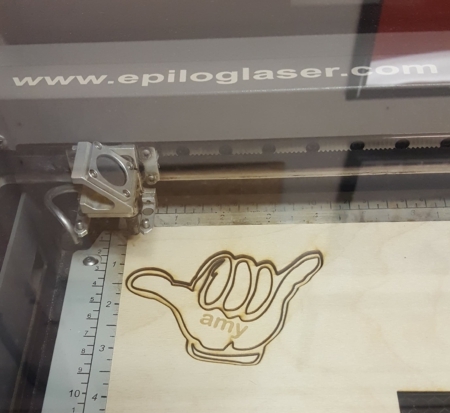 A problem I ran into was that I only wanted to cut the shape of the gesture, but the laser cutter ended up cutting the hand into multiple different pieces. 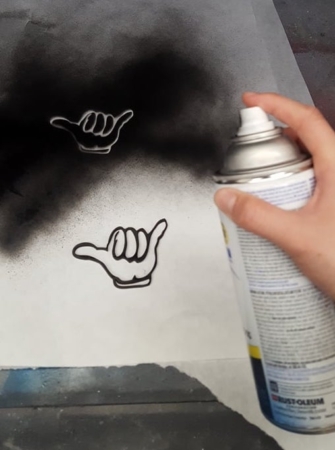 I worked around this and decided to spray paint the outline of the hand black so that the hand is more apparent. I also glued a back panel piece to the hand so that the pieces stayed together. The name might appear crooked, but it you were to tilted the name to a horizontal position, then the hand would be at its correct position. After finishing the project I would’ve changed the print so that the name tag isn’t in separate pieces. I would prefer if the inner part of the hand doesn’t hollow out, however, it worked out because I wanted to spray paint the lining of the hand as well as the back of it. I improvised and reinforced the back of the hand with a piece of thin wood that’s also in the same of the hand. Overall, it was a fun, easy, and quick project.